Since Moon took office in May 2017, he has sought to expand Seoul’s diplomacy beyond the four regional powers surrounding the Korean Peninsula -- the US, China, Japan and Russia -- while maintaining close ties with them. 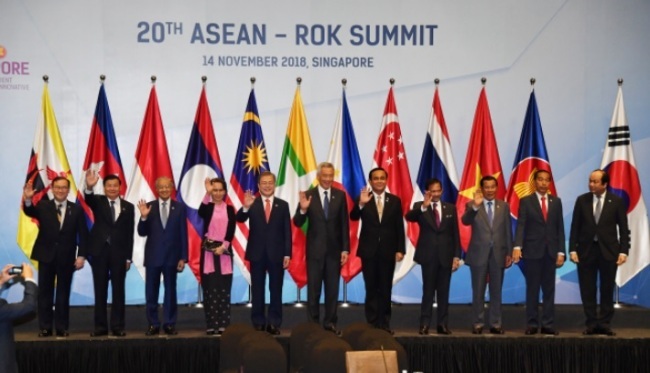 The policy aims to elevate its relations with the Association of Southeast Asian Nations and India to the level Seoul enjoys with its four major partners. The vision stands on the guiding principles of “3P” -- building a community of people, prosperity and peace. South Korea’s two major trading partners -- the US and China -- accounted for 39 percent of its exports in 2018. “Amid the intensifying US-China conflicts, South Korea could use the New Southern Policy as a diplomatic tool to expand its space for diplomatic maneuvering and mitigate the impact of such a competition,” said Choe Won-gi, head of the Center for ASEAN-India Studies at Korea National Diplomatic Academy. “As seen in the US-North Korea summit in Singapore, ASEAN and India can play vital roles in South Korea’s diplomatic efforts to secure international support for denuclearization of North Korea,” Choe said. “There is a need to link the New Southern Policy to the issues on the Korean Peninsula,” Lee Jae-hyon, a research fellow at the Asan Institute for Policy Studies, wrote in a paper published Thursday. India -- home to 1.3 billion people -- is predicted to become the world’s third-largest economic powerhouse by 2024. South Korea seeks to expand their bilateral trade, which is estimated at about $20 billion, to $50 billion by 2030.